Wedding invitations are one of the most popular DIY projects that brides take on, either to save money (professional invites range from $1 to $10+) or create a one-of-a-kind design that guests won't see anywhere else. We've rounded up some of our favorite do-it-yourself invitation tutorials. Whether you're interested in personalizing a basic paper suite or want to design one from scratch, there's something for every skill set. Happy DIYing! 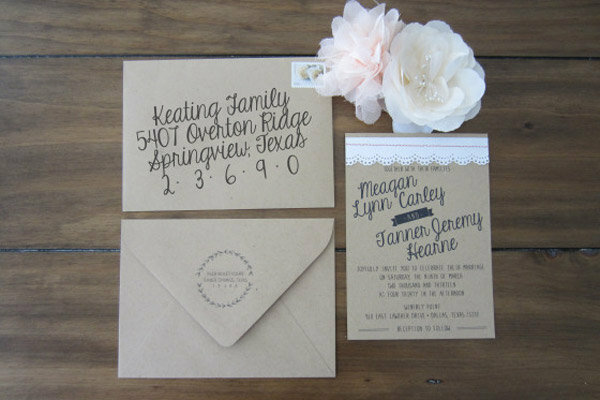 This wedding invitation by Meagan Hearne is ideal for a rustic, romantic affair. What sets it apart is its hand-drawn look, which was created using "KG Eyes Wide Open," a free font, and an illustrated wreath stamp. Hearne writes, "My invitations were one of my favorite DIY projects from our wedding, and since they were one of the first things I finished, they served as a starting point for the rest of my wedding design." This whimsical wedding invitation from Create and Babble was designed and put together by a mother of the bride for her daughter's big day — talk about a labor of love! The butterfly cutout and pink vellum wrap sets the tone for a springtime wedding but we also think this design would work for a bridal shower as well. Here's a look inside the butterfly-accented wedding invitation. The pocket cards that hold the invitation and inserts were purchased from Paper and More, while the accommodation cards, response cards, and direction cards were all handmade. Swoon-worthy invitations that are easy to create? Definitely a "do!" With its white-on-white design, these invites featured on Polka Dot Bride are lovely for a wonderland wedding or for a bride with a classic sense of style. The flocked paper and buckle add a unique touch without being costly. For a semi-homemade approach, purchase a simple invitation set and then enhance it with unique, patterned accents! Color printing can be pretty costly, so this is a budget-friendly way to add a pop of color. You'll need a sewing machine, pinking shears, a corner rounder, and fabric of your choice to complete this project from Project Wedding. Elegant, romantic, classy...expensive? Nope — this elegant invitation was created using Microsoft Word, which you may already have and use on a regular basis. Wedding Window gives helpful pointers to ensure that your typography and spacing are picture perfect. Combining wax, an iron, and a hammer to make this invitation isn't as scary as it sounds. Using melted wax and parchment paper, you can add a personal image to the back of an otherwise plain invitation. Doing so not only saves a ton on printing costs, but it also creates a completely personalized design that you can't find anywhere else. This OnceWed tutorial is a great choice for an artsy bride who is looking to be a little more creative with her paper suite. This adorable DVD wedding invitation by Red Prairie Press will definitely get your guests excited for the big day! This non-traditional option is best for couples who love to shoot home videos or those with a quirky sense of style. The bride designed the "album" cover with a friend and screenprinted the RSVPs, which served as a game of Mad Libs. This pastel-hued paper suite featured on Michelle Gardella was a true collaborative effort. The bride, Ester, worked with Etsy seller Designs by XO to custom design the invitation using inspirational images that she had pulled from the Internet. Then, she sent them to a printing company and made all of the finishing touches (including the custom postage stamps) using an assortment of affordable websites. The envelope addresses were printed at home using a free font that Ester found online. Having an outdoor ceremony? This boho-chic invitation featured on Boho Weddings has a natural, organic feel to it. All you'll need to make this paper suite is pocketfold invites, rubber stamps, and double-sided tape. We love the bride's creative use of stamps — she includes a primer on how to select and ink them properly. The blogger behind depressioneradarlings couldn't afford the professional wedding invitations that she wanted, so she took the project into her own hands and only spent $2.30 per invite! This tutorial takes a little more time and patience, but the work definitely pays off. Using stamps and embossing powder, the images really pop; finishing touches include the doilies and the silk flowers placed at the top. These reception inserts were done on a home computer and printed out at Target for around $20. If your wedding falls more on the formal side, then this invitation featured on Oh So Beautiful Paper is definitely for you. Using different hues of purple and monogram stamps, you can create an invitation that is unique, but still conforms to classic traditions. One caveat: The tutorial warns not to press too lightly or too heavily on the stamps, or you could smudge the ink. Purchase extra card stock just in case! Attention to detail doesn't have to require emptying out your pockets! These eye-catching invites we spotted on DIY Bride were made with card stock, an embossing folder, glue dots, Microsoft Word and a die-cutting machine. The die-cutting machine cuts through different material, from paper to cork, which gives your invitations an intricate look. You can also use it to make monogrammed items for your wedding or a photo scrapbook after the big day. These invitations created by a Weddingbee user couldn't be more perfect for a destination wedding! The bride provides amazingly detailed step-by-step instructions and a price breakdown for each component of the paper suite. She even includes a section with photos that fans have sent in of their customized passport invitations inspired by her design. These invitations will require a lot of patience and hours of assembly time, so make sure you plan accordingly if you decide to take it on.